NYC is Blue: Kreis Out! NYCFC has fired head coach Jason Kreis after just one season. 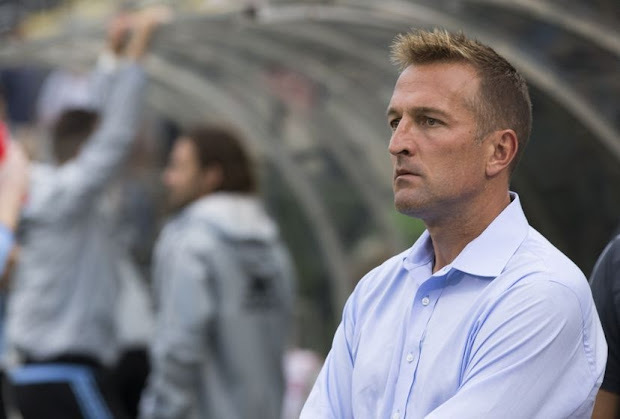 New York City Football Club can confirm that they have parted company with Head Coach Jason Kreis. The announcement comes following a review conducted at the end of a disappointing campaign. The decision has also been made for Miles Joseph and CJ Brown to leave the Club. Prior to the start of the season, it was agreed with the coaching team that the securing of a playoff place was an appropriate target for this year. A win rate of less than one in three games and a points tally which was the second lowest in the league is clearly not in line with the targets that were agreed. While the challenges of building and integrating a new team are recognized, it was felt by the Board, following a comprehensive review, that there was not enough evidence of the dynamics required to improve the performance of the team for the next season and beyond. “The decision to part company with Jason and his team after two years of working together has not been taken lightly and this is a difficult announcement for all involved. We thank Jason for his passion, his efforts and for his contribution to the historic inaugural season of New York City FC. Many memories of this first season will be indelibly etched in the minds of all involved with the Club and Jason and his team have played a huge part in that. The Club is committed to ensuring that a suitable candidate is in place in good time to prepare for the 2016 season and an announcement will be made when a candidate is confirmed. Just as an aside, can this club please find some somebody to write these press releases in American English? You're in New York now, boys and girls. It's long since time. I do appreciate that the club isn't satisfied with the results on the pitch. Nobody's satisfied with the results on the pitch. But expansion franchises aren't known for hitting the ground running. We can't have expected this club to pull a Seattle Sounders and win a trophy in their first season; they had fifteen years of infrastructure-building before joining MLS. I myself have been critical of Kreis over the past few months, his tendency to play his men out of position and his unwillingness to stick with anything long enough to gel. But he hasn't had a full squad for more than a couple months. Hell, City Football Group took away one of his DPs for the first half of the season, and now they're holding him responsible for the results. The obvious question is: who will they find to replace him? Will they find somebody else steeped in MLS, or look for a big-name European coach? I've defended this club through its mistakes and missteps because I've chosen to take the long view. Building a true soccer culture in NYC, a true MLS culture, will take time. For the first time, I think the club has lost that perspective. And it bothers me. A class act all the way. Thank you, coach.